almost all chips with 40 pins or less are available in an easy-to-use DIP form factor. Compiling programs for PIC microcontrollers is easy on a low-resource single board computer like a Raspberry Pi using open-source program languages like Great Cow Basic or JAL. (I may describe how to do this in another post). The challenge is how to get the compiled programs onto the chip. The usual technique is to use a dedicated external device (called a programmer) that attaches both to your computer and to the chip and transfers the compiled program into the memory of the microcontroller. These programmers can be somewhat expensive (usually at least $30) and are another piece of specialized hardware you have to keep around. However, with the right software and a few resistors, you can transfer your programs directly to your PIC using the GPIO pins of a single-board computer (SBC) like a Raspberry Pi or Orange Pi. troubleshoot it if it didn't work out properly. This method works only with PIC microcontrollers that can be programmed using the low-voltage programming (LVP) method, which includes most common PICs in use today. (Darron has a list of supported PIC microcontrollers on his site as well as a large table of PICs that have been tested.) It will not work with older chips that require the high-voltage programming (HVP) method. For those chips, you'll need a programmer, not just a few resistors or level converter. This compiles and installs the Pickle utilities in /usr/local/bin on your SBC. 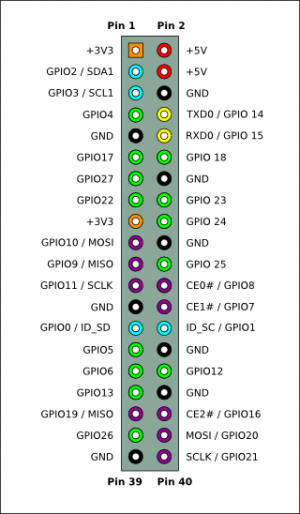 For the Raspberry Pi 2 or 3, I recommend using GPIO_9, GPIO_10, and GPIO_11. For PICs like the 16F1788, where the PGD and PDC pins are also serial port pins Rx and Tx (respectively), pins GPIO_14, GPIO_15, and GPIO_18 work even better, because you can use same pins to both program the PIC AND communicate with it over the PIC's serial port. This assumes your PIC doesn't have or need to use a PGM pin to program it in LVP mode. If the PIC you are using does (e.g., the 18F14K50), you'll need to select a fourth GPIO pin for that function as well. For this board, I recommend using either gpio_1, gpio_0, and gpio_3; or gpio_13, gpio_14, and gpio_110. The latter option is best if you want to communicate with the PIC's serial port and the PIC's serial port pins are also programming pins. Again, this assumes your PIC doesn't need to use a PGM pin to program it. If it does, you'll need an additional GPIO pin for that function, too. (A sidenote: It took me a while to figure out how the pins are numbered on the Orange Pi boards. The GPIO pins are identifed by a letter corresponding to a bank location and a two-digit number associated with its position in that bank. For instance, pin "PD14", which is in the 12th position on the header, is the 14th pin in bank "D". Therefore, header pin #12 is gpio_110. Some of the I/O pins on the header may be configured for other tasks and aren't available to use as general-purpose I/O pins. How to determine which pins are available depends on which Linux kernel your board uses. There are two basic types, older 'legacy' (3.x) kernels and newer 'vanilla' (4.x) kernels. You can determine which Linux kernel you are using via. The version number is listed after the words 'Linux' and your hostname. In this case, it's 3.4.112. If it's less than 4, you are using a 'Legacy' kernel. If it's > 4, then you're using a 'vanilla' kernel. Newer kernels have a different configuration system known as a 'device tree'. Follow these instructions to view your settings. Once you know which GPIO pins you can use to program your PIC, you create the configuration file required by Pickle for programming the chip. This file is named '.pickle' and stored in your home directory. A sample file is created when you install the software. You can either edit the existing file or create a new one. In this configuration, GPIO pins 9, 10, and 11 of the Raspberry Pi will be connected to the VPP, PGC, and PGD pins on the microcontroller. PGM won't be used. If your chip requires a PGM pin to program it using LVP mode, you'll need to change the "-1" to the GPIO pin number you'll be using for that function. Here, we're using gpio_13 for PGD, gpio_14 for PGC, and gpio_110 for VPP. I chose these particular pins because some PICs (like the 16f1788 I'm currently using) have an alternate mapping of their serial Tx and Rx pins over the PGC and PGD pins, respectively. This allows me to use the same lines to both program the chip and communicate with the chip over it's UART. This frees up two extra pins on both the board and the chip. This arrangement will also work on an Orange Pi PC or Orange Pi PC Plus. Once everything is installed, wire your chip to the GPIO pins on your board using the pins you selected in your .pickle file. (Darron recommends putting a ~470 ohm resistor in series in each of the programming and Vpp lines to prevent damage in case you make a mistake; I've used 1K ohm resistors with no problems.) Be sure to wire the ground line, too, as well as the 3.3V line if you device is not self-powered. If your device is self-powered by 5V at the time you're programming it, you'll need to use a 4-channel 3.3V-to-5V level converter between your device and your SBC, because most SBC GPIO pins are 3.3V. So, if you want to program, say, an 18F25K42, this indicates you will want to use the 'n16' command, not the 'p16' command. pic14_read_config_memory: information: device not detected. when running the command above, either you're running the wrong command (p16 instead of p14, for instance), it's wired wrong, or your have something wrong in your configuration file. See the troubleshooting section below. where < command > is the command from the table above, and < file_to_flash.hex > is the hex file you want to upload to the chip. Again, leave off "lvp" if you are programming a PIC32 part. The LED should blink. Repeat for PGC and PGC as well. If an LED blinks in each situation but one, then you either are using the wrong GPIO pin or that pin isn't configured correctly. If none of the LEDs blink, check your configuration settings, make sure your board has power, and you have permissions set correctly.